Yesterday we talked about how homemaking isn’t about perfection. And about how homemaking is about creating a space that feels like home. You know that feeling you get when you walk through the door of your home after being gone for a few days? Coming home is such a relief. Coming home everyday – even just after making a quick trip to Wal-Mart should make you feel good. It should make your husband and children feel good. That’s what creating a home, a haven does… it welcomes the weary soul like a warm, soft blanket. Hospitality is like that too. When we share our home, our space with others, we’re not just sharing a sofa, or a room, or even good food. When we share our home with others, we’re offering a piece of ourselves, a piece of our lives to another person and that’s a sacred thing. I don’t know about you, but I just feel better about having people over if the house is neat. I know some people are comfortable having folks over when things are less than tidy. And I have certainly done it many times. But I feel better when the house is neat. Here’s the thing. 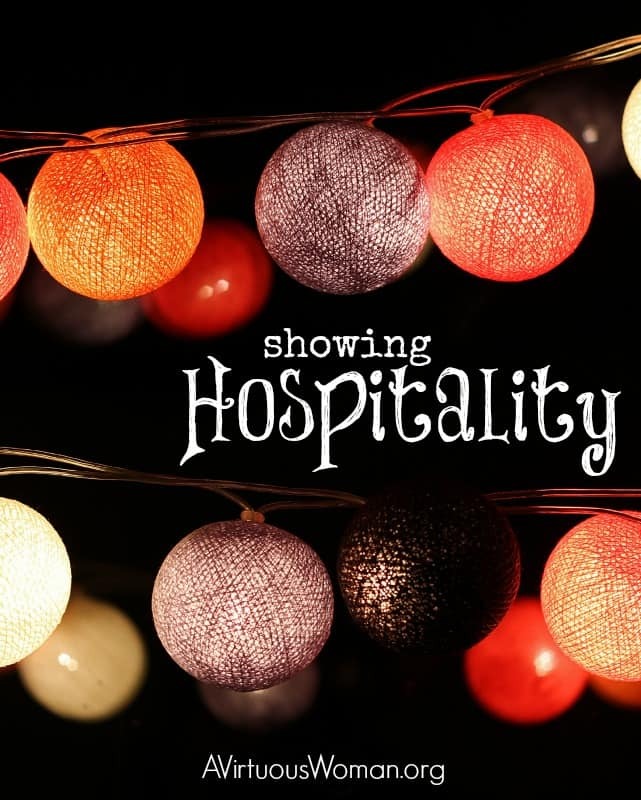 Hospitality is not about impressing your guests. You don’t have to have a perfect home, a perfect space, perfect table setting, perfect anything to show hospitality. But having a neat space where people can feel welcome and comfortable is a nice gesture toward your guests. I can relax easier if I know my house is neat and I’m not going to be embarrassed if my guests open the linen closet. Or walk downstairs. Or need to use the master bathroom. All things that have happened to me when those spaces were less than neat. On more than one occasion. Decluttering makes it easier to have a neat space which means you will have less to worry about if someone drops in, or someone calls and says they’ll be over in 15 minutes, or you decide to spontaneously invite someone home from church. There’s also an upside to regularly inviting people over. At least this works for me. It’s an incentive to really straighten things up if you have a tendency to let things go a little long. Showing hospitality whether it be to your family, friends, neighbors, church members, or a stranger is a way for us to extend the hand of Jesus to another person. It’s a chance to show someone else we care and that they have a Father in heaven who also cares. It’s a chance to build relationships and build people up. Because when a person realize that someone genuinely cares, their life is changed. You don’t have to have nice dishes, expensive food, or designer furniture. You do need to have a warm smile, an open heart, and a willingness to let go. We have two picnic tables in our front yard and a fire pit. We often hosts meals outside. I’ll set up folding tables for the food and string Chinese paper lanterns up around the area so we have lighting as the sun sets. My husband will build a fire and often we’ll roast marshmallows or hot dogs around the fire. I’ll cook yummy but simple food and we’ll have a great time sharing food and good conversation with whoever comes – almost on a weekly basis when the weather is nice. And on more than one occasion we’ve had to move the “party” into the dining room when a sudden rain shower popped up! 1. Keep it simple. Some women are born to throw parties. I’m not one of them. Although I do like to set a nice table or host festive meals outside. Despite the fact that I enjoy cooking, when I have a crowd over, I usually serve something easy to prepare. 2. Get the kids involved. Let the kids help you clean the house. Let them help with the food. Let them help set the table or string the outdoor lights or pick flowers for the centerpiece. Kids love to share in the work and it gives them a sense of belonging. 3. Relax. If you’re not used to having people in your home, it can take some getting used to. But the more you do it, the easier it gets. Your friends and family want to enjoy YOU. So don’t be anxious. Laugh. Have fun. Enjoy your own cooking. Sit down and chat. Relax! Consider inviting someone over for dinner – or lunch. Keep it simple. Think of ways you can make your guest feel at home in your house. Choose an area in your home you want to tackle. I’ll be working in my bedroom today. I love the idea of the picnic table and firepit in the front yard. I just finished reading Turquoise Table and now reading your suggestions, just makes me want to step out and put a table in my front yard. Thank you for the encouragement.